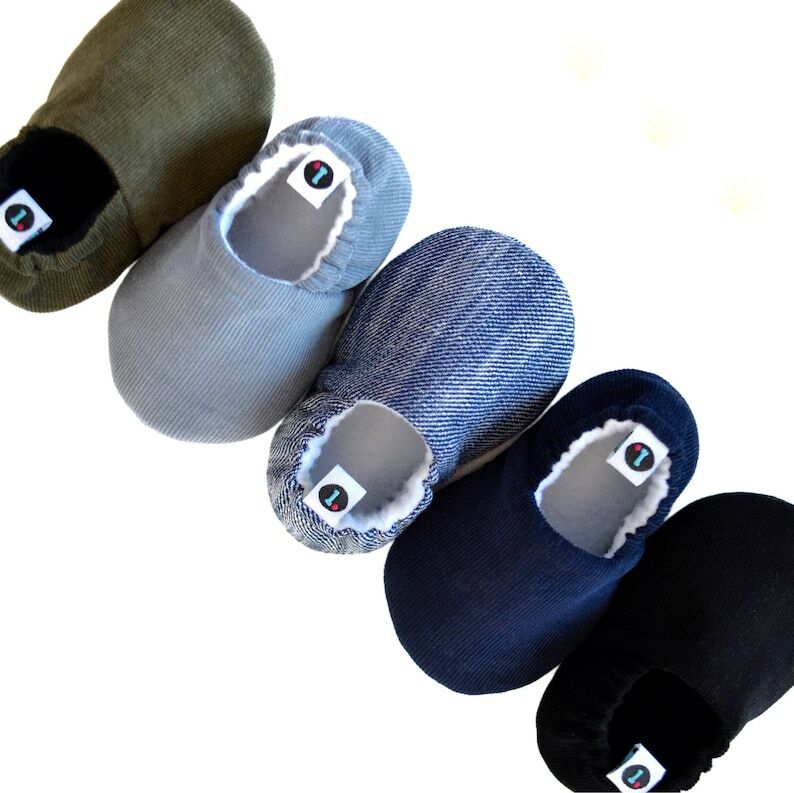 [ The Little Loafie] Handmade baby slippers in soft cotton corduroy uppers and soles for your sweetest babe... Gender neutral perfection, fashionably flexible, and a huge crowd favorite! These booties are exactly what busy moms need to keep their babe's sweet little feet both covered and stylish... Easy for Mommy to slip on using the high-quality woven pull-tab brand detail, but difficult for Baby to kick off! Upgrade to luxe leather soles (a natural, non-slip textile) in a rich dark black tone. Leather soles recommended for wobblers/walkers, or size 5 and larger. Your order will arrive in swathed in tissue inside a hard shipping box. Need it gift-wrapped? Select the option at checkout - it’s the perfectly cute way to present your sweet gift! QUESTIONS ABOUT SIZING? See this shop's FAQ section for detailed instructions on how to choose the correct size. >>> Does your babe have an *EXTREMELY* tall, chunky, or "fat" foot? Leave a note at checkout for the "X" option. Your pair will be cut with an extra .25" of height (not width!) to accommodate the extra pudge! NOTE: Most do NOT need this extra space! Selecting it may cause an ill-fit. This shop does not accept returns or exchanges. >>> Need a larger size? Message me! >>> NEED IT FAST? Select "USPS PRIORITY + RUSH" as your shipping option. Your order will skip to the head of the production line and ship within 3 business days with 1-3 day delivery via USPS Priority service. >>> IMPORTANT: Please familiarize yourself with this shop's policies prior to checkout. Successful checkout indicates your acceptance of these policies, and no exceptions will be made. Zebra gift bag with turquoise tissue paper. If purchasing multiple items, please specify which items should be packaged together via note to shop. These booties are perfect! They fit well and really stay on her feet! They are of nice quality too. I'll definitely order the next size, once my baby grows out of these. Measure the length of the foot in inches, then add .5"- Look below to choose the closest size to the final number. Don't be alarmed if your measurement doesn't match the chart's age approximation - it's only a general guide! DO NOT base your size choice on experience w/ other brands! Ex: 1) Foot is 4.25" long; 2) Add .5"; 3) Final = 4.75"; 4) Size to purchase = Size 3, 4.75" long. 0 = Preemie + NB 4"
Does your babe have a VERY chunky or "tall" foot? Leave a note at checkout indicating you'd like the "X" option. Yours will be cut w/ extra height (not width!) to accommodate the pudge. Suggested care for footwear is hand or machine washing on a cool or gentle cycle, hang or lay out to air dry. **Submerging leather products is NOT recommended due to potential color bleeding on light-colored cotton uppers. Apparel and bibs are machine washable on a regular cycle, tumble dry. Felt heart accessories should be spot-cleaned only. Yes, I wholesale! Message me for detailed information on becoming a wholesale account. Need your order gift-wrapped? No problem! Please select the gift-wrap option at checkout including any gift message you'd like to include to your recipient. If purchasing multiple items, be sure to indicate which items should be gift packaged together. Otherwise, all products ship swathed in tissues, inside beautiful hard-sided shipping boxes. This shop ships via USPS First Class, Mondays-Fridays. Please allow 24-48 hours from the receipt of your shipping confirmation email for package to process into the USPS tracking system. If you need expedited delivery and/or wish to jump to the head of the production line, please select the USPS Priority upgrade at checkout which ships within 3 business days on a 1-3 day delivery commitment by the USPS. Shipping time within the US is normally 2-5 business days for first class mail, and 1-3 business days for Priority service (Saturday delivery included). However, shipping transit times are not guaranteed by USPS, and can take up to three weeks. Standard shipping does NOT include package insurance. Once your shipment leaves the Shop's possession with a tracking number, responsibility for its delivery lies with the USPS. You are advised to use your tracking number to research and/or file a claim directly with the USPS for a lost package or non-delivery. Seller cannot provide any additional tracking information or assistance on parcels once shipped. If you believe your package to be missing or lost, please submit a search request with the USPS. Standard free, USPS first-class shipping does NOT include package insurance. Priority service strongly suggested for those who receive mail delivery through an un-managed community mailroom or similar. Packages confirmed as delivered by USPS will not be replaced by Shop. I forgot to use my discount code, can you help me? Discount codes will not be added to orders retroactively, but message the shop for a rain-check to use on your next purchase!